Hi friends! 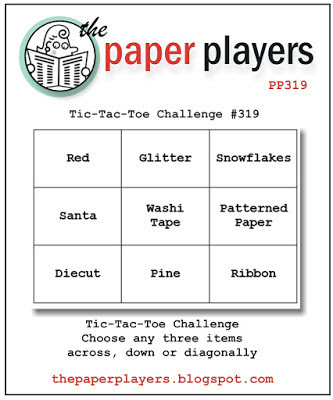 My sweet and talented friend LeAnne is hostess this week at The Paper Players, and she has a fun holiday themed Tic-Tac-Toe board for us to play along with. I was very excited when I saw it because I'm looking forward to getting started on some holiday cards. I went across the top row: Red, Glitter and Snowflakes. So glad you stopped by today! I'd love it if you left a comment, then please check out the creations by the rest of our Design Team at The Paper Players. We'd love for you to play along, too! Beautifully colored blooms!Love that glitter panel at the side, such a well designed card. I have the same issue as you..I have tons of cards I keep,too. Sometimes I will make 2... one for me and one to give..LOL! Oh I love the background snowflake paper--it adds so much dimension and interest. These poinsettias are gorgeous and your coloring is beautiful. The glitter just makes it even bettah, darling! Gorgeous! LOL!!! I just went through all my cards and I have a lot too! Hopefully I can sell some at a craft show! Anyway, this is just delightful! I think this is such a pretty poinsettia and I love the snowflake background you chose! Just divine! Sandy, this is really beautiful. I love the gold glitter paper added down the side too, it really makes the poinsettia's pop! Sandy, I love the touch of glitter paper - I never remember to do that - but it is perfect with the Poinsettia. You colored those beautifully, too. beautiful card. So, so, so Pretty, Sandy! The glimmer paper under the focal image combined with the sequin is yummy. And, so is the coloring on these pretty flowers.